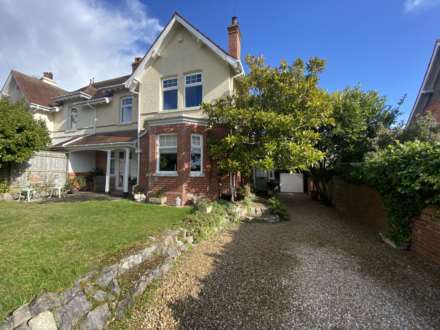 Offered for sale with NO ONWARD CHAIN and presented in good condition throughout is this 3 bedroom and 2 shower room, detached modern house, on a small development of just 6 properties and located in this ever popular East Devon Village. This electrically centrally heated and uPVC double glazed property comprises, on the ground floor, of cloakroom, bay fronted living room with Stone fireplace, uPVC double glazed conservatory, modern fitted kitchen (with appliances) and a further conservatory. On the first floor are the 3 bedrooms (all having storage), master en - suite shower room and further shower room. There is a landscaped rear garden and a garage to the front. Situated within walking distance of the village amenities, an appointment to view is strongly advised. Well known for its beautifully thatched roofs and quaint cob and brick cottages, Otterton is sheltered by the idyllic Otter valley. It boasts one of the oldest working Water Mills in the country. Amenities within the village include a Church, Shop, Public House and Primary School. The privately owned Ladram Bay Holiday Park is situated on the outskirts of the village with the Coastal Towns of Sidmouth, Exmouth and Budleigh Salterton just a short drive away. Obscure glazed window to front. Modern white suite comprising low level WC and wall mounted wash hand basin. Tiled splash backs. Radiator. Coved ceiling. uPVc double glazed windows to 3 sides. Radiator. uPVC double glazed external door leading to rear garden. uPVC double glazed external door to rear garden. uPVC double glazed windows to 3 sides on rendered brick walls. Radiator. Telephone point. Window to front. Radiator. Useful linen storage cupboard with electric heater. Access to insulated loft space. Coved ceiling. Doors leading to the bedrooms and shower room. Obscure glazed window to rear. Modern white suite comprising corner shower cubicle with thermostatically controlled shower unit. Low level WC. Vanity wash hand basin. Fully tiled walls. Heated towel rail. Inset ceiling lights. Window to rear. Built - in double wardrobe. Radiator. Telephone point. Coved ceiling. Window to front. 2 fitted storage units. Radiator. Coved ceiling. Obscure glazed window to front. Modern white suite comprising corner shower cubicle with electric shower unit. Concealed WC. Vanity wash hand basin. Heated towel rail. Fully tiled walls. Extractor fan. Airing cupboard housing the electrically heated boiler that supplies the central heating and domestic hot water. There is a small area of Front Garden that is laid to lawn with a pathway leading to the front entrance door. Outside water tap. Outside meter cupboard. Outside lighting. The landscaped Rear Garden has ease of maintenance in mind being laid to patio with a raised shrub bed to the rear providing year round interest and colour. A raised decking area is ideal for outdoor dining and sitting during the fine weather. Timber summer house. Timber fenced and wall boundaries. Log store. Front pedestrian access to side of property via timber garden gate. Please note these measurements are taken from a neighbouring garage. Up and over door to front. Power connected. From our prominent Exmouth Town Centre office, proceed out of town, along Salterton Road, towards Budleigh Salterton. Before reaching Budleigh Salterton, turn left, proceeding through Knowle. At the end of this road, turn left through East Budleigh and continue up the road towards Bicton Gardens. Before you get to Bicton Gardens, at the crossroads, turn right into Otterton. After passing the Kings Arms and the turning for Ladram Bay, the property will be found on the left hand side, clearly identified by our For Sale sign.